Since today is Columbus Day, NHL does not have school. I took the boys to get something special out for lunch and we brought it back to Nana’s house. Nana went with us to the library after that to return some items. 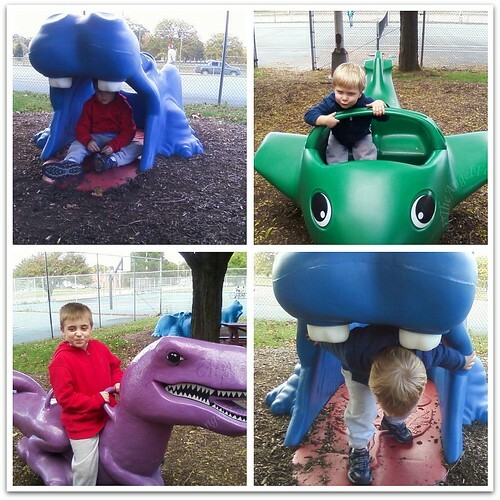 We picked up a few new books and then went to the park. This is the point that I realized I had left my camera at home (batteries are acting up again). So please excuse my cell phone photo quality, but it helped to capure some moments in time. Then I asked for a photo of the two of them together – NOT! 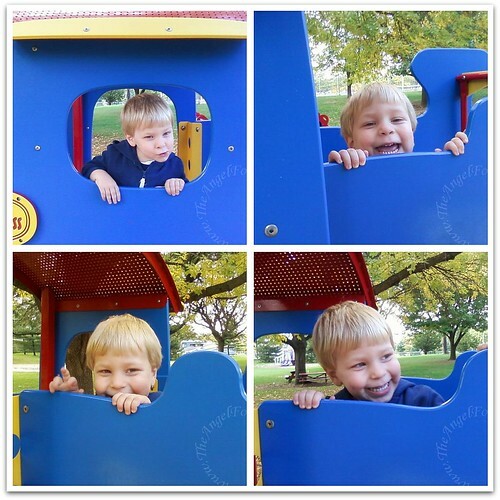 A three year old and seven year old do not stay still long enough on a playground for long. 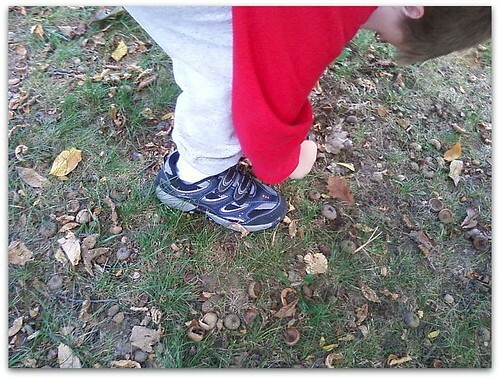 Nana had the boys stop to check out the acorns on the ground. NHL was really into investigating the holes in the ground where they were located. 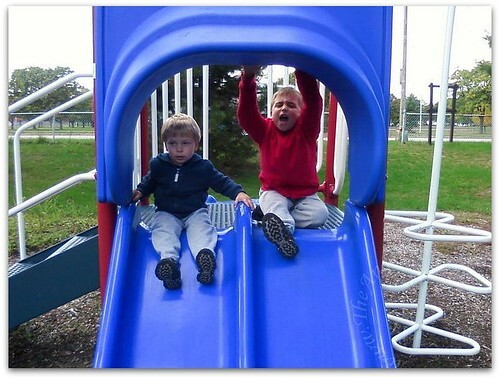 After that, it was big blue slide time. 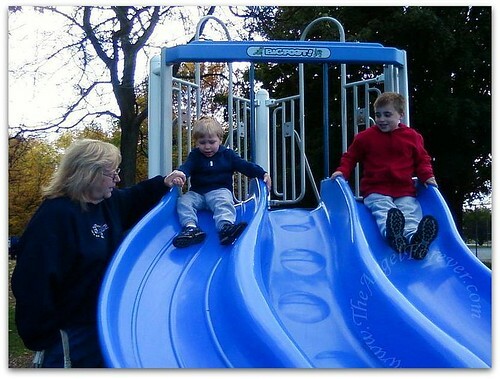 For some reason, JSL wanted to hold Nana’s hand on the way down. Next, they were both eaten by a hippo, flew on an airplane, and rode on a giant purple T-Rex. 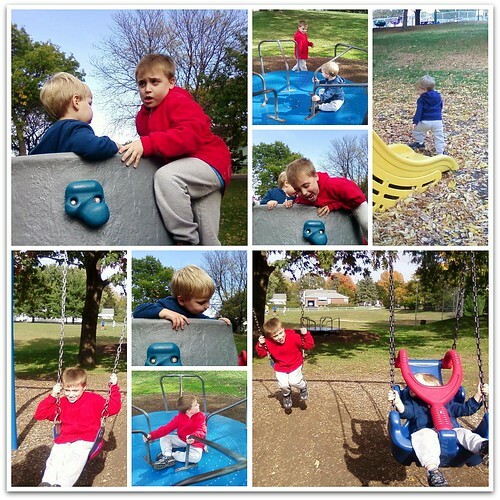 And last but not least they spun themselves dizzy, were swinging to the sky, and went rock climbing before heading home. Sorry for the day off, but I am spending it with my two sepcial little boys. With any luck, the weather will continue to be like this and I will get a few more fun afternoons outside with my kiddos.